The world-famous novel about the triumphant story of St. Luke. Man of science, and Gospel writer. Today St. Luke is known as the author of the third Gospel of the New Testament, but two thousand years ago he was Lucanus, a Greek, a man who loved, knew the emptiness of bereavement, and later traveled through the hills and wastes of Judea asking, “What manner of man was my Lord?” And it is of this Lucanus that Taylor Caldwell tells here in one of the most stirring stories ever lived or written. Lucanus grew up in the household of his stepfather, the Roman govenor of Antioch. After studying medicine in Alexandria he became one of the greatest physicians of the ancient world and traveled far and wide through the Mediterranean region healing the sick. As time went on he learned of the life and death of Christ and saw in Him the God he was seeking. To find out all he could about the life and teachings of Jesus, whom he never saw, Lucanus visited all the places where Jesus had been, questioning everyone–including His mother, Mary–who had known Him or heard Him preach. At last, when he had gathered all information possible, he wrote down what we now know as the Gospel according to St. Luke. Taylor Caldwell has chosen the grand, the splendid means to tell of St. Luke. Her own travels through the Holy Land and years of meticulous research made Dear and Glorious Physician a fully developed portrait of a complex and brilliant man and a colorful re-creation of ancient Roman life as it contrasted in its decadence with the new world Christianity was bringing into being. Here is a story to warm, to inspire, to call forth renewal of faith and love lying deep in each reader’s heart. 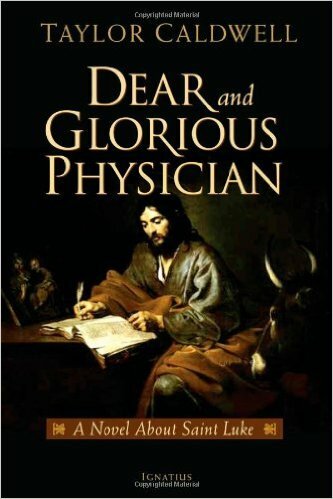 Taylor Caldwell‘s book on Luke the physician who in his later years traveled with St. Paul and who is believed to have authored “the Gospel according to Luke” is a masterpiece. The time Ms. Caldwell spent staying in and studying the Mediterranean world as well as absorbing all the information she could find about Luke paid off. This book is absolutely fascinating — full of action, very well researched and written so vividly as to make the reader feel that he is living right there with Luke and accompanying him on his journey through life, his search for meaning in life and his first-century A.D. world. The problems of the physician in those times weren’t much different from today in terms of trying to cure disease, bring new lives into the world and help the dying to leave it with as little pain and suffering as possible. What is very interesting is how much the physicians of his time did know, knowledge which was much more than our 20th-century generations give them credit for. However, for a man who outwardly had a very successful life, the real meat of the story lies in his feelings of being unfulfilled in his work and his constant seeking and yearning for deeper meaning to his life. Where he travels, whom he meets and how he finally comes to the discovery of this meaning bring the inner man to life and give us an excellent insight into this most special physician. Don Moen Reveals Tragic Story Behind Hallmark Song “God Will Make A Way” – Releases First Book Ever!